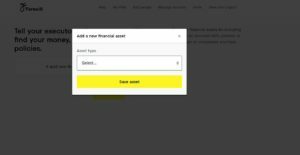 Tax » Inheritance Tax » Farewill Review – The smartest way to do a will? In this independent Farewill review I look at the services they offer, how much Farewill costs, its pros and cons and how it compares to other similar services. I recommend you read the full review in order to understand if it may be the right will writing service for you. In short I feel that Farewill’s services could be suitable for some readers (but not all) and I have obtained an exclusive offer that gives MoneytotheMasses.com readers £15 off the price of a single or couples will. In the interests of transparency MoneytotheMasses.com will receive a small payment if you do decide to take up the offer and take out a will. However editorial independence is paramount to MoneytotheMasses.com and in no way is this review or my views ever influenced by 3rd parties. Therefore I have also included a link to Farewill at the foot of this article which you can use and MoneytotheMasses.com will not receive any payment from your referral but nor will you receive a discount. What is Farewill and how does it work? Everyone would like to know that their family will be looked after when they pass away, but many people have not written a will. A will is a legal document that sets out your wishes for how your assets will be distributed once you die. But it's not just about your assets, as your will can also state who will become the legal guardians of your children. Alarmingly, research has shown that around two-thirds of adults have no will in place, which will put their assets and legacy at risk. Many people think that creating a will is complicated and costly to setup, leading them to steer clea. This is where online will writing service Farewill comes in. It aims to simplify the will writing process, helping people compile their will in less than 15 minutes and get it checked by a qualified solicitor. Founded by Oxford University graduates Tom Rogers and Dan Garrett, Farewill was launched in 2016 to create “simple and affordable digital wills you can update anytime,” and has received financial backing from the founders of property portal Zoopla, newspaper publisher DMGT and SAATCHiNVEST. Farewill claims it now writes one in 30 wills in England and Wales and by the end of 2019 this is forecast to reach 10% of the market (i.e one in 10 will be written by Farewill). What services do Farewill offer? Farewill helps you create an individual will or a couples' will, which is also be known as a mirror will if the wishes of the couple are identical. The document is compiled automatically based on your responses to an online questionnaire. First of all you are asked whether you live in England and Wales or elsewhere. This is important as it can only compile wills based on the law of England and Wales so if you live elsewhere then unfortunately the service is not for you. The next series of questions concern your personal situation such as marital status and if you have any children. Once these details are added you are ready to login and start completing the will. 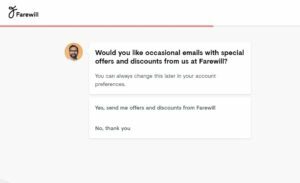 Before you get to start detailing where your assets should go, Farewill asks if you want the occasional email with special offers or discounts from itself or partners. If you opt into this it could mean getting lots of emails for other financial services products, which may pay a commission to the company. It is then time to get into the nitty gritty of the will. You will see a personalised page that tracks how much of the document has been completed and how long each section will take. You need to list your assets from a simple drop-down table such as your pensions, bank account or savings. This is so those managing your wishes – known as the executors – know where to find all your money when it needs to be distributed. Once you have detailed your assets you need to decide who will receive them, known as the beneficiaries. This can be your children, a relative, friend or a charity. You need to decide on how assets are split between your beneficiaries and you are also asked to consider where the funds will go if one of the parties passes away before you do. There is also an option to allocate gifts such as money or jewellery to people or charities and to leave instructions for your funeral. Once your assets and beneficiaries are outlined you need to choose your executors who will ensure your wishes are followed through and are responsible for making sure debts or taxes are paid. This role can be completed by relatives but can be time-consuming and complicated so you can also use a lawyer to do this. Farewill offers its own service through Farewill Trustees for a fixed fee of £1,000-£2,750, depending on the complexity of the estate. In comparison, other professional executors can charge a percentage of the value of an estate, which can end up costing a lot of money. You don't need to use either service and most people just appoint a friend or relative of similar age to them. The final stage is paying for the document to be checked by Farewill’s legal team before you can download it. They will spot any errors that could make the will void and promise to raise any issues for you within five days. Farewill even has an option to let you go back and alter the document when necessary, such as if you were to get married, divorced or have children. At the end of the process you get a legal document that you can download. It will need to be signed by witnesses for it to be valid and you need to tell your beneficiaries or executors where it is stored. How much does Farewill cost? Farewill charges £90 for a single will and £135 for a couple, and you also get unlimited access to live phone and chat support every day of the week. There is also an optional subscription service that in return for £10 a year you will be updated on any law changes and you will also be able to alter your will. However, I have secured an exclusive deal that gives Money to the Masses readers £15 off the price of a single or couples will. Choosing Farewill Trustees as an executor, which you don't have to do, also has a charge which is a fixed fee of between £1,000 and £2,750 depending on how complicated your estate is. Users can also earn £10 by recommending friends and family who will subsequently get 50% off the price of their will. Farewill is offering a low cost and accessible way to complete a will. People can often be put off by stuffy law offices or legal jargon so producing a will online in under 15 minutes has huge appeal. Farewill simplifies and speeds up the process and makes it as easy as applying for car insurance. It is also cheaper than a lawyer who may charge by the hour or by a flat fee ranging from £200 to £500. That is part of the reason why Farewill can price its services so low and it also means you won’t get support for more complex estates. For example, there is very little support for inheritance tax planning and the website says it also doesn’t provide an option for including property as a gift in the will as the consequences are complex and require advice. If you are likely to need to make lots of gifts and have a complex estate with lots of potential tax liabilities you may be better off paying for legal advice and a solicitor who can ensure your will is drafted property and legally sound. Customers seem pretty pleased with Farewill so far. It has a Trustpilot rating of excellent based on more than 1,600 reviews. Most reviewers praise how easy the site is to use. Just 1% of the reviews describe the service as bad, citing the language used in its popup chatbots while you complete the will or mistakes in the final document. As mentioned, you don’t need a solicitor to make your will. Farewill is not a solicitor and is just providing an online template to complete your will plus a legal team who will check it for any errors and anything that could result in it being contested. 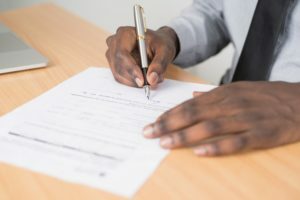 There are also blogs and articles on its website that explain the legal terms such as what an executor or beneficiary is as well as the importance of different types of will. In comparison, a solicitor will both help you write the will and provide advice on the legal and tax implications of your decisions. This may be more suitable if your estate is more complex and you don’t have the time to keep up with legal developments yourself. You also get further protections with a solicitor as you can complain to the Legal Ombudsman. Using a solicitor may be more expensive than Farewill but you are at least getting advice and further protection if you need it. There are other firms such as MyLawyer which provides a range of legal services such as will writing, contracts and tenancy agreements and is run by solicitors and therefore subject to the Solicitors Regulation Authority and Legal Ombudsman rules. Some insurance companies such as MoreTh>n also offer legal expenses cover, which includes online will writing, so it is worth also checking your policies for free services. Farewill’s closest competitor is Which? Wills. Which? actually uses the technology behind MyLawyer’s service, which is powered by legal software company Epoq. Which? 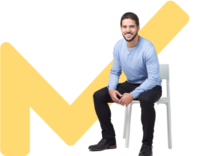 Wills offers online will writing but has more levels of service than Farewill depending on your marital status and if you are doing an individual or joint will. It also lets you draft documents according to the law in England and Wales, Northern Ireland and Scotland, while Farewill currently only offers this in England and Wales. Which? pricing starts at slightly more expensive than Farewill. You can get a self-service will from £99 for an individual or £156 for a pair that you just complete and download yourself. This won’t be checked for accuracy but there are prompts throughout the process to make you consider the legal implications of your decisions and you can phone their helpline with queries. Its own legal team will review the document for £119 for an individual or £189 for a pair. There is also a premium service at £169 for an individual and £259 for a pair that Which? prints, binds and delivers to your door but also gives you a year of free storage. Unlike Farewill, Which? offers other online templates to compile and purchase such as power of attorney documents which may be as important as your will and also offers storage and a will locator. Which? charges a one-off £19 fee if you want to make a change to your will or £39 if you want it checked. This compares with the £10 annual subscription Farewill charges in case you need to make an alteration. No-one wants their death to cause family disputes and making a will ensures your final wishes are clearly set out and that your loved ones benefit from assets you built up over your lifetime. Plus you can ensure that your children are looked after by the people you want them to be. looked after by. Farewill does a good job of making it low cost (especially via our £15 discount offer), accessible and easy enough to compile this document, especially if your needs are not too complicated. But it is important to understand the service you are getting. This may not be suitable for complex cases where you require legal advice and have lots of assets such as property or children and partners from previous marriages. You do get a legal expert to check your will for any risks but remember the liability lies with you. Making a will ensures your loved ones are looked after and helps avoid any disputes. If you die without making a will then anyone with a claim on your estate must follow the rules of intestacy. Under these rules, close relatives such as a spouse or civil partner or child can inherit your estate but it can be hard for anyone else. This could cause an issue if there were certain assets you wanted to leave to particular people or if you had separated from a spouse. It is particularly important to have a will if you share a property with someone who is not your husband, wife or civil partner or if you run a business with others as this can set out how you want your share to be dealt with in the event of your death. Also, there may be former spouses or children from a previous marriage that you may want looked after in a certain way. The same goes for if you are a parent as you can determine who looks after any children below age 18 and appoint guardians if both you and the other parent pass away. Ultimately, setting out your wishes in your will helps ensure your relatives are sure of how you want your estate to be treated and reduces the risk of your memory being spoilt by disputes over what has or hasn’t been left.